Combining convenient �commute-free� location with an incomparable approach to quality construction, Balboa Ridge offers an exceptional carefree lifestyle and an extraordinary home value. 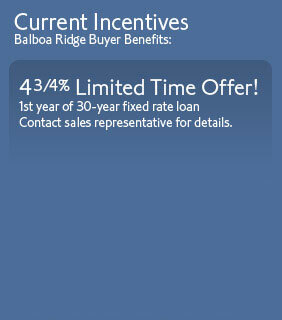 Balboa Ridge is situated within minutes of all the variety that makes the San Diego lifestyle so very special�beaches and Mission Bay�SeaWorld and the World-Famous San Diego Zoo�downtown San Diego, Petco Park and the Gaslamp Quarter�La Jolla, University Town Center and the North Coast communities. Easy freeway access can take you anywhere quickly and effortlessly…and Balboa Ridge offers plenty of attractions to keep you close the home, including three swimming pools, Grand clubhouse and exercise facility. Shopping and dining are within easy walking distance. And the homes at Balboa Ridge have been reNEWed…reconstructed from the framing studs…providing you an almost new condominium home. All in all, it’s a comfortable and convenient lifestyle…and a sensible home ownership decision from every perspective. Come home to Balboa Ridge. You’ll be happy you did. Specifications, details and features are subject to change without prior notice. Model homes feature decorator touches and items not included in homes. See sales representative for details. Square footages are approximate and may vary with unit location. Map is not to exact scale. Prices and financing are subject to change without prior notice.